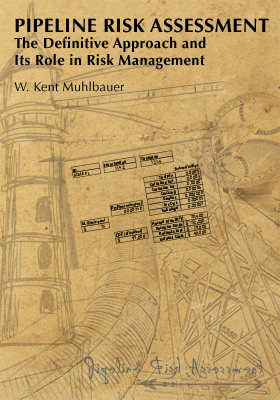 Pipeline Risk Assessment: The Definitive Approach and Its Role in Risk Management. 2015. This 550+ page book presents the definitive approach to assessing risks from pipelines–an approach that overcomes the limitations of previous methodologies. The methodology detailed here is a practical, easy-to-apply technique for measuring risks associated with operating any type of pipeline in any environment. Management of those risks is then optimized by proper utilization of the assessment results, as is fully discussed herein. concepts, PRC allows you to divide your pipeline system(s) into sections, gather meaningful data on each section, and assess the risks of each section. A host of analytical routines then allows you to slice and dice the data to get information out of the numbers. Note: this software was designed around an older scoring-type methodology, no longer recommended. Please see www.pipelinerisk.net for details of the new risk assessment methodology. No methodology-specific software is offered at this time since pipeline risk assessment can be efficiently performed in any database, GIS, or spreadsheet environment. The ‘workhorse’ software of pipeline calculations, this set of 16 routines builds upon a time-tested, proven program which originally appeared in 1983. Version 4.02 offers features which reflect the capabilities of today’s computers and operating environments. Most routines allow you to calculate upstream pressure, downstream pressure, flowrate, pipe diameter, and length, based on your input for the other variables. Several routines produce graphic displays of computational results automatically. Reference databases, unit conversions, clipboard utility, and a host of other features will make you want to keep PipeCalc an active icon on your desktop. Over 200 equations built in for quick calculations. All of the articles (more than 400) in the text edition available on CD with keyword search capabilities. Also includes: hundreds of tables, graphs and illustrations, sample procedures and forms, performance curves, conversions, physical and thermodynamic properties, and glossaries of terms.